We have free linen, laundry facilities and free Wi-Fi and iPad rental! Free Dinner Join your fellow travellers for a free meal, every night 18:30 in the Downtown Cafe We're located in the old part of downtown Copenhagen, next to City Hall Square. 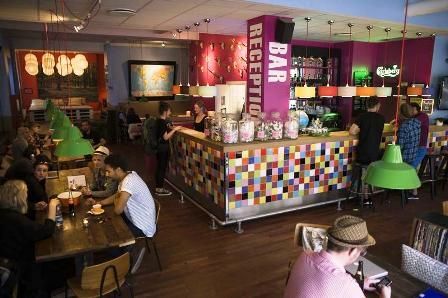 Our location is outstanding for Copenhagen hotspots, whether it's the nightlife, the longest walking street in the world (Stroget), restaurants, theatres or attractions like Tivoli, the harbour beach or museums, galleries or parliament. Bohemian Christiania and the world famous the Little Mermaid are also close by. With handy transport links on your doorstep, you are within easy reach of everything that the city and the rest of Denmark has to offer. Our style is relaxed, cosy and Scandinavian, made in a modern way. Our lounge provides the ideal surroundings to chill out, relax or socialise with other guests. Join us for some DVD's in our cosy lounge bed! GET FREE EARPLUGS AT THE RECEPTION IF YOU FIND IT NOISY IN YOUR ROOM! If you're looking for more liquid entertainment, make yourself comfortable in one of downtown's cheapest bars, located right in the lounge area there you can enjoy playing pool, foosball or darts with your (new) friends. We've got tournaments and Happy Hour every night. Special beers to taste its value for this country. We also have Free Walking tours starting from the hostel at 10.45 every morning. We have 75 rooms to suit every budget. 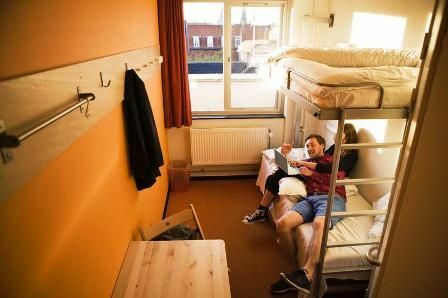 There are private rooms for two-to-five people or shared dormitories for four-to-10 people. Many of our rooms feature private bathrooms and individual power sockets, seating areas, personal reading lights, hand basins and mirrors. Private lockers are available for only DKK30 for 24hrs. All private rooms overlook the square (named Vandkunsten) with a fountain from year 1910 - a real oasis. Our caffe offers an all-you-can-eat-and-drink breakfast buffet for an unbeatable price. Feel free to cook your food in our new guest kitchen. Did you know that guests from more than 40 countries stays with us every month? Come home to a warm welcome from the staff! CU soon!' Cheers!! Conveniently located right next to Nørreport station which is the metro station, with metros running directly to Copenhagen Airport in only 12 minutes. The metro and S-tog station Nørreport is only 700 meter from the CPH Downtown which gives easy access to the whole of Copenhagen and the rest of Denmark.From Copenhagen Airport: take the metro to station Nørreport, cross the street and go down Nørregade - Nytorv - Rådhustræde (all same streets). CPH Downtown is located in the square opposite the second fountain (200 mts after the two little squares). Instead of walking you take bus 14 (heading Jydeholmen/Ålekistevej ) from Nørreport metro station for 3 stops- same ticket as used in the metro.From Copenhagen Central Station: take bus 2A heading Kastrup and get off at 2nd stop (at the canal) walk down Rådhusstræde for 75 meters to the square. CPH Downtown is located in the square opposite the fountain. Alternatively you can walk - it’s only 500 meters; walk down Tietgensgade (backside of Tivoli) and keep going to Stormgade, turn left first time and then turn right at Løngangsstræde for 100 meters to the square.